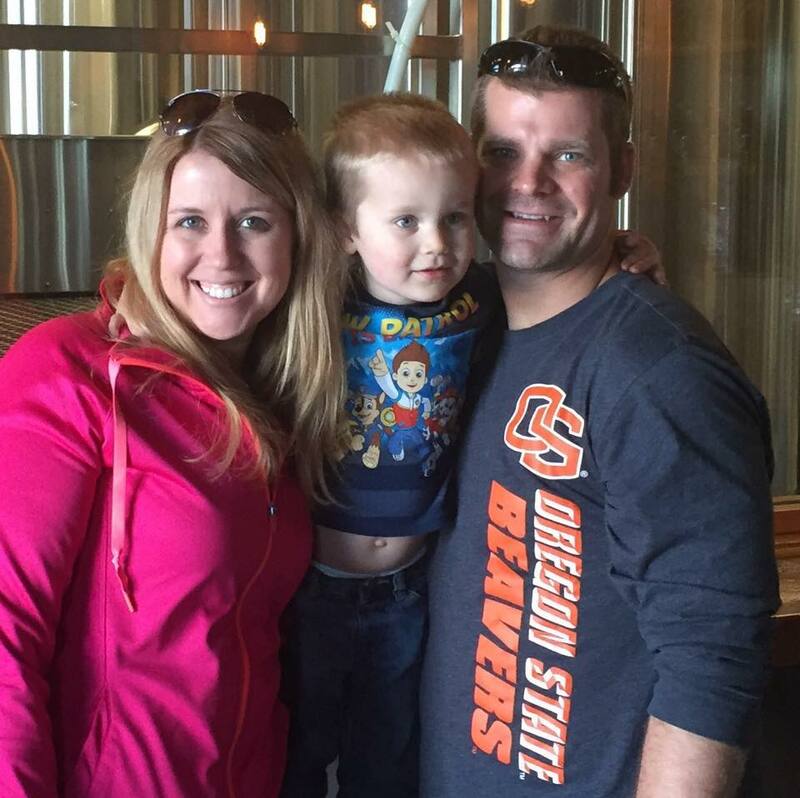 Pints with Half Pints | Because it's ok to love your kids and your beer! 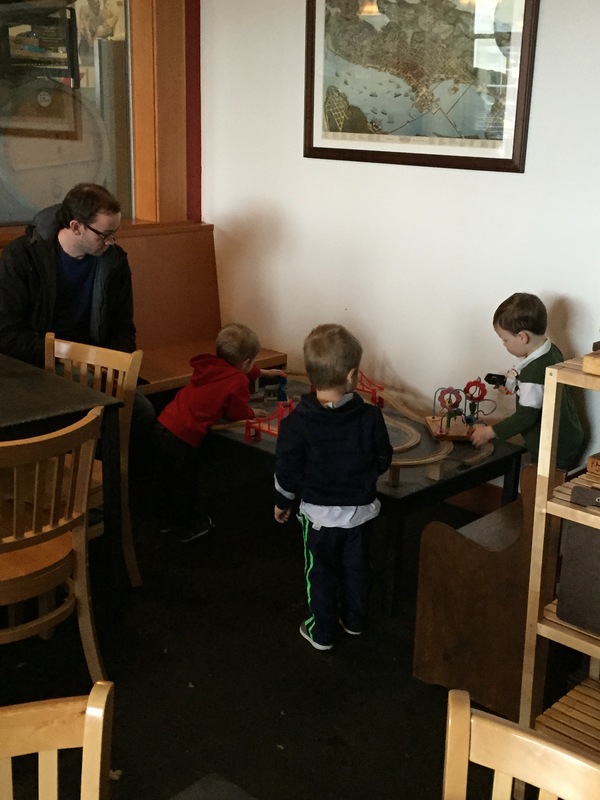 It has been FOREVER since I’ve blogged…and the other day I got sad about it; because I love sharing my feedback on kid friendly places with you all. Twitter has just been a quicker and easier way to do it, but I’m ready to get back on the blogging train. With a kiddo, two furry kiddos and well, life–I’m going to do things a little different, and not just blog about places we go, but give tips and insight on spending time with your half pints in general. I hope you dig the new format. I’ve missed you! !…and Cheers! 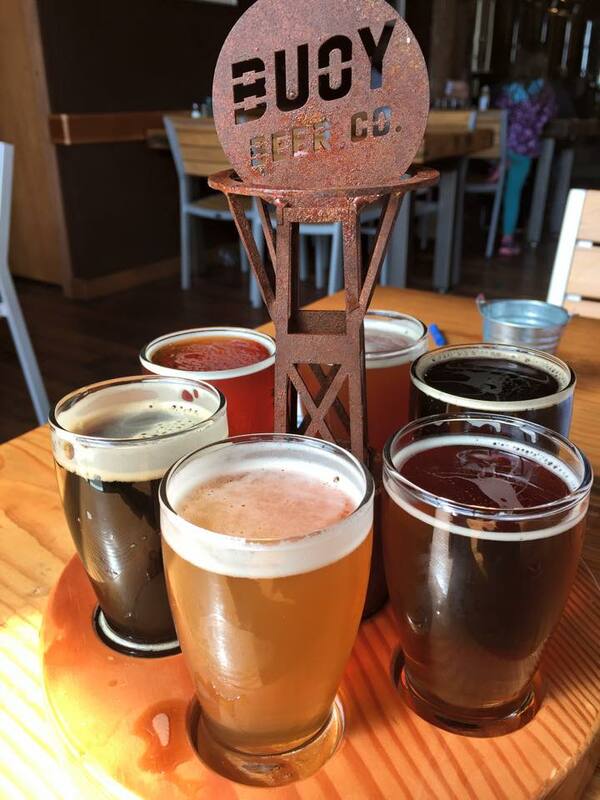 One of my new favorite places to take our half pint is the Schooner Exact Brewing Co. restaurant in Seattle. We happened upon it one day when we were in Seattle on a Saturday playing tourist with some friends. We had planned to go there for lunch, but when we stopped we found out they just had brunch going on. Starving we went ahead and ordered–and I had the sandwich that I now compare all other breakfast sandwiches to–the McClung Steak melt. Everyone we were with fell in love with their amazing breakfast/brunch foods. 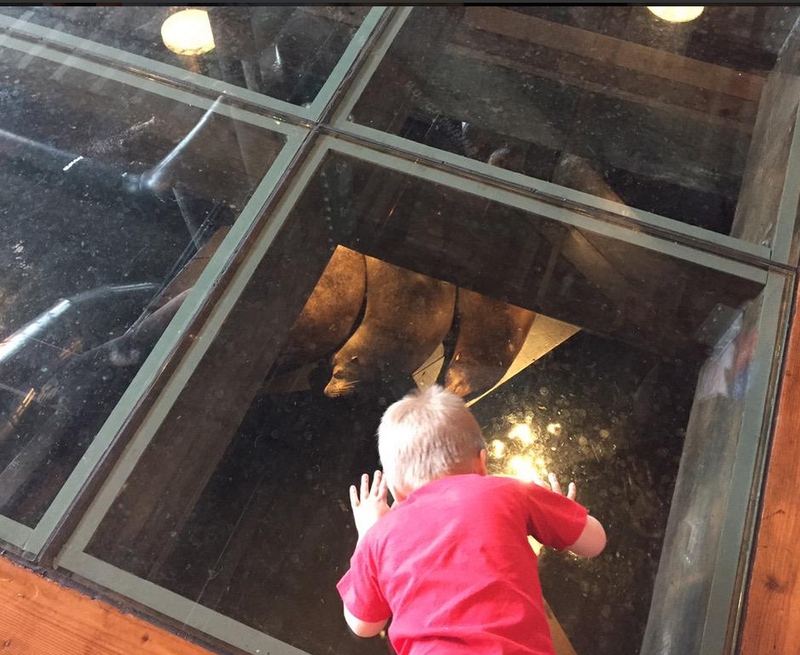 So enough about the food–lets talk about how kid friendly they are. They have a kids play corner with lots of books, toys and a train set. They also have several tables that are chalk-top so that kids (and adults) can color while eating. Their kid’s menu is anything but normal–which was perfect for our kid. They had pizza and grilled cheese, but also had items like ants on an apple (raisins and PB on an apple), baguette and cheese (which is all our kid wants to eat anyway! ), and a PB, Banana and Bacon sandwich called the Elvis. The drink that comes with it is also served in a water bottle type cup for easy drinking for your half pint. We had minors ranging in age from our son (who is 2.5), to a middle schooler, to two high schoolers–and they all loved the menu and had fun at Schooner. The older kids really liked all the fun soda flavors they had like Cucumber, Blood Orange, Mexi-Coke and Vanilla Bean. The adults (as I’ve already mentioned) loved the food; and we loved the beer too. They have a great sampler that lets you try all their beers; and if you have someone with you who is not into beer with brunch they also have Mimosa’s. The location was a little hard for us to find, but once we did it was another thing we really liked about it. It’s in the industrial area right past the West Seattle bridge. If you are like us and coming from the south it’s nice to have a brewery you can hit up without having to go through the entire city. We have been back several times since our original visit and will be back again soon! Cheers!! Wow, am I behind on updating you all on some great kid friendly breweries! They are popping up faster than I can keep up; and I’m not complaining!! As always, follow me on twitter for more up to date information—but now I’m going to get a little more in detail about some of the places we’ve visited. First up!—Hopworks. Despite what it looks like from the front this is a HUGE brewery and restaurant located in Portland. All you have to do is drive around back and you will see all the big tanks, gorgeous hops and LOTS of parking (take note of this, so you don’t try to squeeze into the front parking lot). Best of all this place was MADE to bring your kids to. First there is the play area. 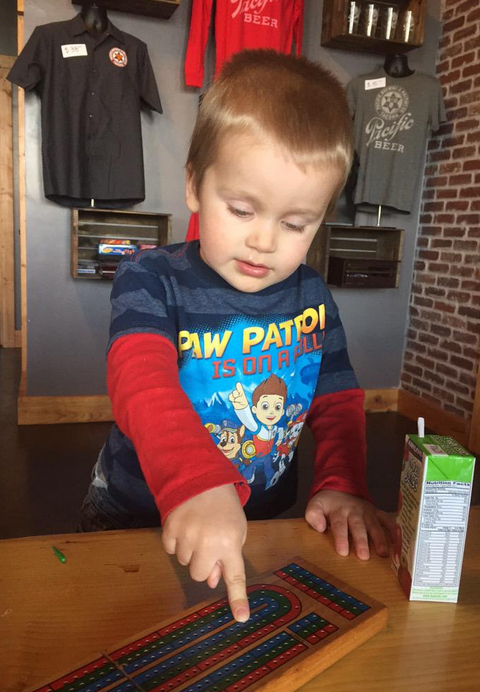 With books, chalkboards, toys and everything else you can image to keep your half pint happy until their food comes. 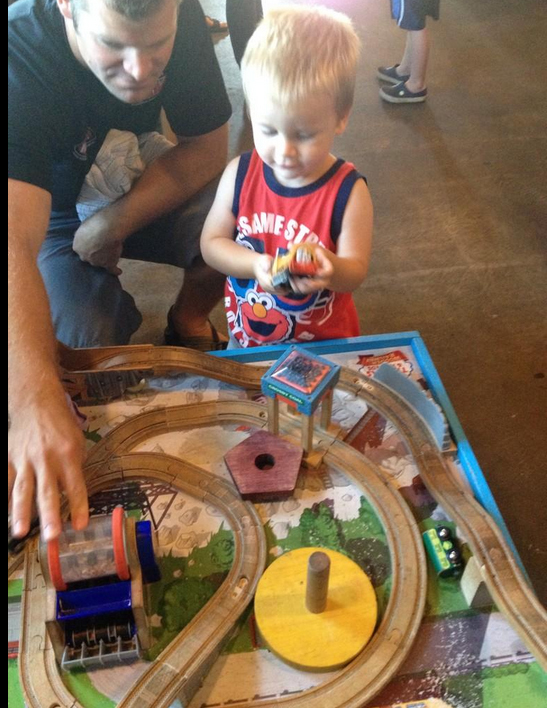 We were lucky and they sat us RIGHT next to the kid’s area (some may not find that lucky, but for us when we can sip our beer and still see our kid playing with trains it is a win). The kid’s menu is another highlight of this kid friendly establishment. It’s very reasonably priced (only 4.75 per meal) and your kids can choose from the standard pub fair AND also get apples, veggies or our fries and apple juice or milk. Along with this they have BABY food on the menu (how cool is that?!). Along with the menu and play area they also have kid friendly events throughout the year at both this pub and their “BikeBar” also located in Portland. 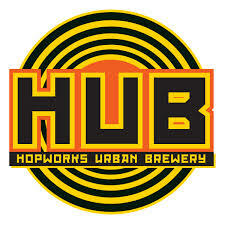 You can visit http://hopworksbeer.com/families to find these events. The adult food and beverages were also good. The sampler platter is HUGE so if you get that I highly recommend sharing. 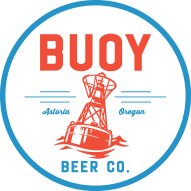 If you are in the Portland area I highly recommend checking this place out whether you have half pints in tow or not. 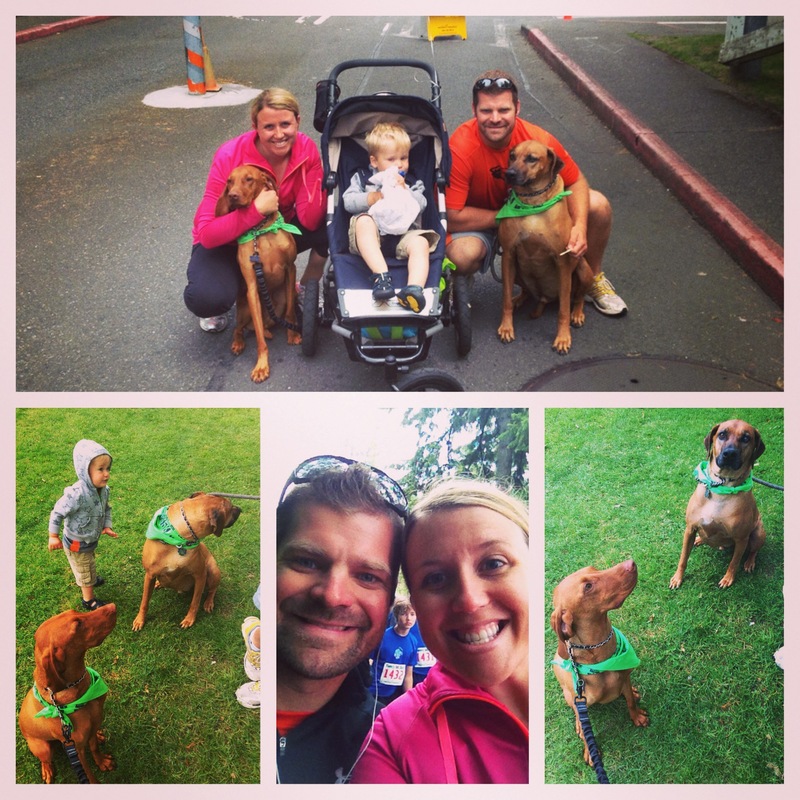 We had a blast this weekend in Seattle running in the Furry 5K (a dog friendly race at Seward Park) and visiting a nearby brewery, Machine House Brewing. First the race. I am NOT a good runner, but it was so fun. We were able to run it with both of our dogs and our son. It was great to see all the pooch lovers of Seattle out, and even more fun to get to see all the great vendors that were there. If you have a dog (or just like dogs) this is a great event that I would recommend doing next year. You can find out more info at http://www.furry5k.com. Now back to why we are here…beer. 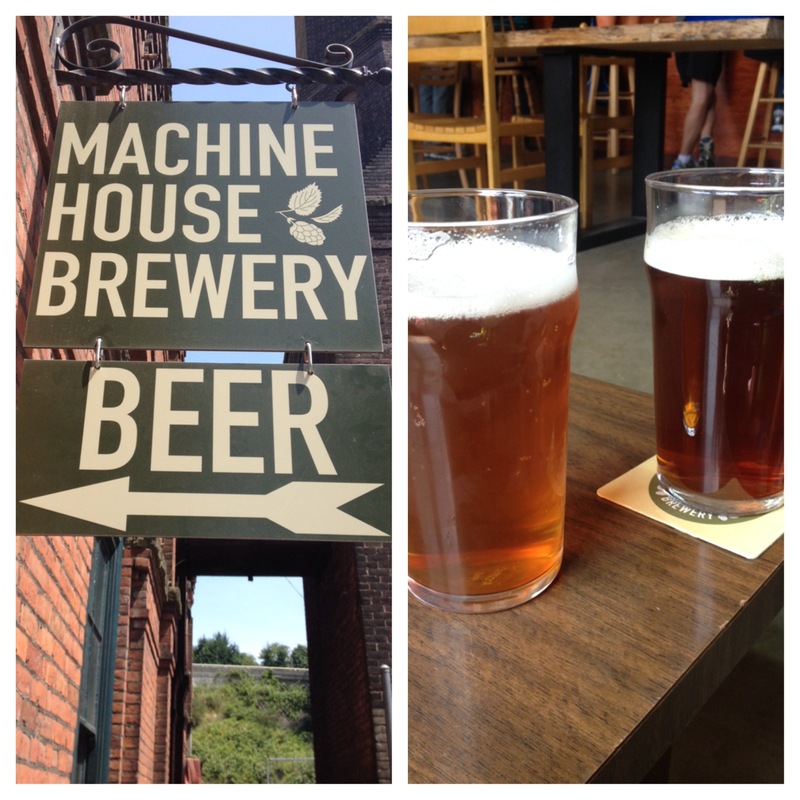 We used Yelp and searched for breweries near us and the only one open was Machine House Brewery in Georgetown, and I’m really glad they were. If you have kids this place is a gem! 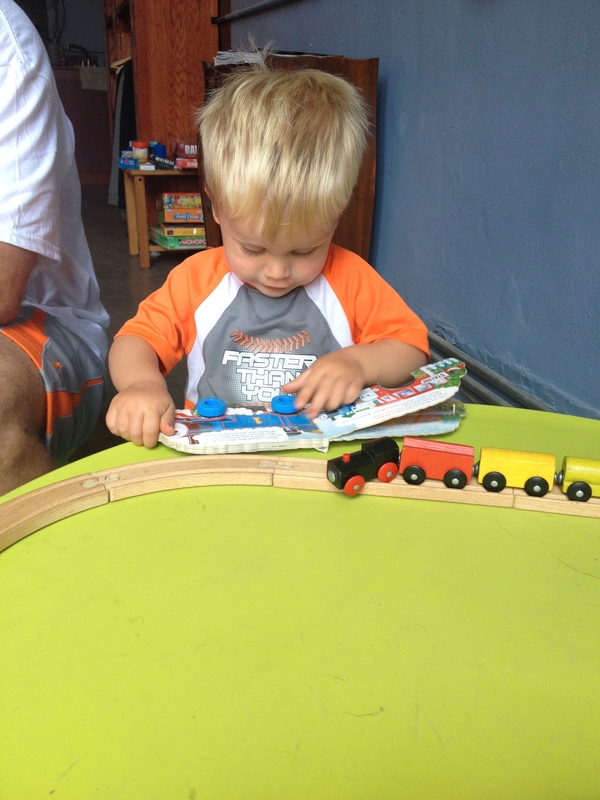 First, they have a play area with a train set, books, and play table. We had a somewhat tired half pint with us and this perked him right up! They have a big tasting room which is nice because you don’t feel like your kid is bugging other people. They don’t really have any food or drinks there for kids (they do sell chips), but you can bring in your own snacks (for you and your half pint) and drinks for the kiddo. We have found this to be a good idea anyway recently with the boom in breweries that are just that, breweries, and not pubs with food. Since it WAS Furry 5K day also I better mention that you can also bring well behaved pooches in! Ours were solidly passed out in the truck after the run…otherwise we would have had them in tow. If you are down on Airport Way this is a must. The beer was also really good (and different!). They have three English style beers Mild, Gold and Bitter. They also had an IPA on tap. 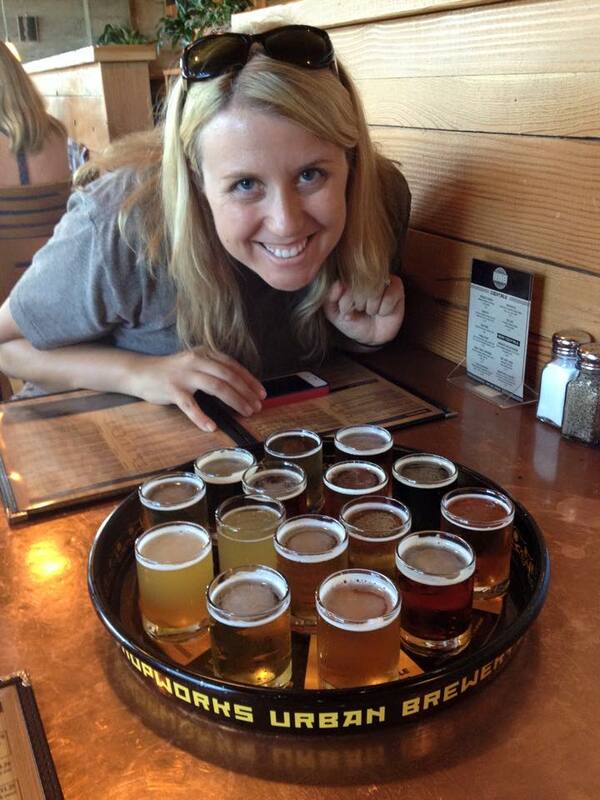 Great easy drinking beers for a hot Seattle summer day!